With Old Man Winter on his way, Avery wants to help warm everyone up! "The winter solstice is on it's way, and we honor this darkest month of the year with the annual release of our even darker Mephistopheles Stout, a roasted demon who bleeds at over 16.4% ABV. Not only will the fallen angel make his appearance, but Maharaja's swords will swing again, spreading his holiday cheer in the form of Imperial IPA, 102 IBUs of hop varieties, and a maltitude of flavor. Is that not enough? Well how about 3 days of draft Rumpkin at the Avery Tap Room the week before Christmas? Still not enough?! Well, you're our kind of beer drinker - cheers! This coal-black demon is amazingly complex. Velvety with a bouquet of vine ripened grapes, anise,chocolate covered cherries, and a double espresso finish. Mephistopheles is sure to make your holiday season a little more sinister. We will be hosting a vertical tasting with Mephistopheles from 2009, 2010, and 2011. The vertical includes wonderful meats, cheeses, and chocolates from our good friends at Cured on Pearl Street. We will have a lesson on beer pairing from our Tap Room Manager, Phil as well as Cured's own Will Frischkorn! Tickets to the vertical will be released the day of the party at 11 am, limited to 50 people, and they are $20 first come first served! 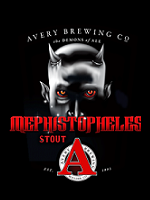 Not to worry if you cannot make it to the vertical tasting, Mephistopheles' Stout will be pouring in the tap room, along with many other very special brews!"